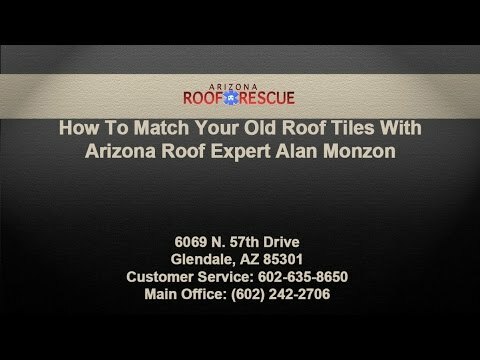 Arizona Roof Rescue will go through a company that salvages or reclaims old roof tiles. This company will already have a range of old roof tiles available, as well as have a large database of smaller companies that will have roof tile inventories. In this search and match process, most likely a roof tile match can be made. What’s needed to make a proper roof tile identification is to have a sample or photo of the tile you are trying to duplicate. We’ll then use our tape measures to get the exact measurements on the tiles. A visit to the jobsite for a roof tile inspection is ideally the best method. Once the tile is identified, it’ll depend on how popular the tile is to locate it. Some of the searches on achieved in hours. Even though sometimes the results can go both way, negative or positive results. Other searches can take up to weeks to months, depending on the amount available before the tile is needed. I doesn’t matter if you old tile roof is made of concrete or clay. If you do have clay tiles, they are most of the time more expensive and difficult to salvage and replace. Though if you have concrete roof tiles, they seem to deteriorate more quickly which make it more salvageable as more roof tiles are available. The search effort will remain the same with either product. As most of the time, available roof tile inventories are referenced throughout the country in a reasonable amount of time. If your tile match can’t be achieved through the salvage market, you will have several options from there. You can have salvage material from an isolated roof area and use the tiles for the required work, and reinstall a close matching tile on the area where the tile was removed from. Or you can have your tile reproduced if your tile roof is made of clay. Then, you’re last option would be to get a full roof replacement. You have any more question or concerns about how we match your roof tiles, give Arizona Roof Rescue a call today. We’ll help and achieve a perfect tile roof repair for you.